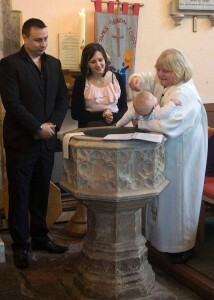 A baptism (also referred to as a christening) is a special service where we welcome a new member into our church. A child’s baptism marks the beginning of their lifelong faith journey in the church. During the service we give thanks to God for the gift of a new life, parents and godparents make promises to support the child through their journey, and the Church welcomes the child, promising to support and pray for them. Services usually take place on a Sunday, either during our regular 10:30 service or on it’s own as a special service. To discuss baptism at St James please contact the church office in the first instance. Some parents may wish to celebrate the birth of their child and give thanks in Church, without making the commitments baptism involves. In this case, a thanksgiving service may be appropriate. If you would like to find out more about this, our Vicar, Teresa will be pleased to discuss these options with you.